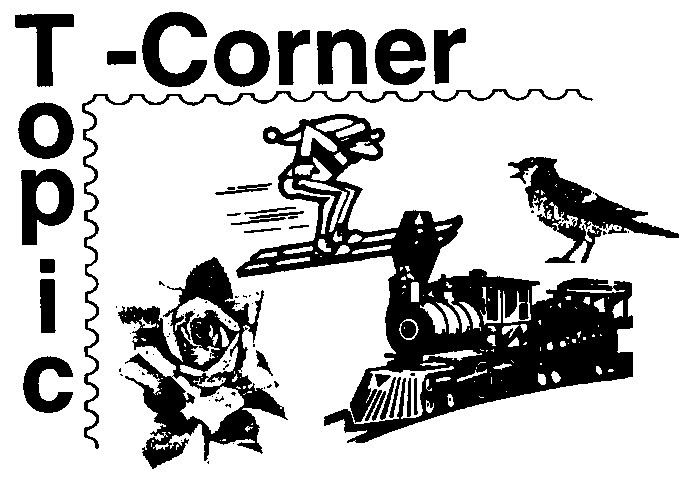 This page includes The Topic-Corner columns from the 2004 issues of Across the Fence Post. Although National Topical Stamp Show is history now, it deserves particular mention here because of the Wisconsin Connections! In the exhibition arena, it is with great pleasure that I can announce that the Grand Award Winner was Roland Essig for Man Beneath the Sea. Gold medal winners for the multi-frame competition were, in addition to Essig, Robert Mather with The Donkey in Man’s World and Fred Ziemann for Wolf. Winning Silver awards in the multi-frame competition were Verna Shackleton showing The Grand Tour: Churches in Middle Europe and Claude Giralte’s Swimming Pool Water Sports. In the single frame exhibit category, Jack H. Green was awarded a silver for Jules Verne: Prophet of Space Travel and a silver-bronze for Icarus and Daedalus. Not only did Wisconsin take home many metals, they also were a prominent group at the show. According to attendance statistics, Wisconsin had the third greatest attendance – even more than Illinois and Arkansas. Although held in Memphis, one might expect that Tennessee might have the greatest number of people in attendance. However, that state ranked second behind Mississippi. It has been reported that the Wisconsin contingency seemed to find each other’s company for everything they did – from the tours to eating out at local restaurants. Adding to the prestige that Wisconsin had already brought to the show was the election of Robert Mather to President of the American Topical Association. He becomes the 17th person elected to that position since the inception of the ATA in 1949. And now for the really exciting news!!!! The 2005 National Topical Stamp Show will be held in Milwaukee, Wisconsin. Already the committee is hard at work planning to make the event even better than the one held here previously. Plan now to make Milwaukee a destination in June 17 – 19, 2005.